Frank Sullivan, the current Harvard men’s basketball coach, speaks with members of his team. He will not return next year. 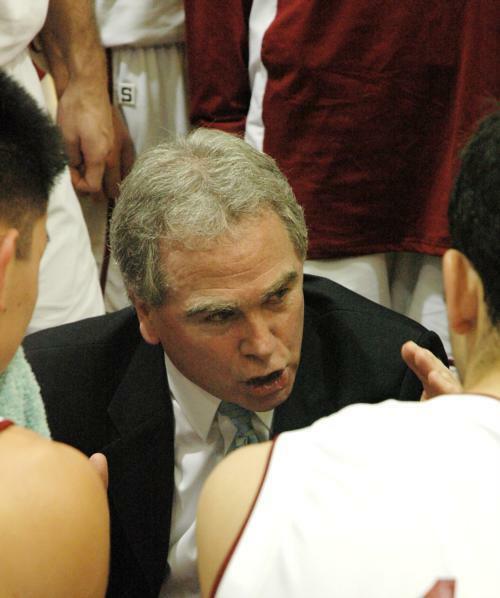 Frank Sullivan will not return as coach of the Harvard men’s basketball team next year after 16 seasons leading the Crimson, the University announced yesterday. Although Sullivan led the team to more wins than any other coach in Harvard history—finishing with a record of 178 wins and 245 losses—he failed to pilot the Crimson to a first Ivy League championship during his 16 years as coach. A member of the athletic administration said that Nichols Family Director of Athletics Bob Scalise made the final decision not to renew Sullivan’s contract, which is set to expire after this season. The Crimson finished 12-16 overall and 5-9 in league play this year. The administrator was granted anonymity because the athletics department forbids its employees from discussing personnel matters with the press, and naming the source would hurt the individual’s relationship with athletics officials and Sullivan. During his tenure, the longest of any basketball coach in Harvard history, Sullivan could not challenge the Ivy League’s top teams. Either Princeton or the University of Pennsylvania won every league title during his 16 years. Harvard came closest to the title under Sullivan’s guidance in the 1996-1997 season, finishing 17-9 overall and 10-4 in the league. That year marked the only above-.500 league season for Harvard in the 16 Sullivan-led campaigns. Harvard posted a winning overall record just four times, including back-to-back 14-12 seasons in 2000-2001 and 2001-2002. But in 2003-2004 the Crimson stumbled to a 4-23 record, and last year the team collapsed down the stretch with eight straight league losses. Last season’s 5-9 league finish was more of a disappointment than this season’s identical mark. The 2005-2006 team was picked to finish second in the league in the preseason media poll, while this year’s squad was picked to come in seventh and ended up in sixth. Scalise, who did not return a phone call requesting comment, met with the members of the team yesterday afternoon to discuss the plans for hiring a new coach. Scalise and the team worked out a system that will allow the players to have direct influence on the decision-making process, said forwards Evan K. Harris ’09 and Bradley T. Unger ’08. The timeframe for hiring a new coach will be two to three months, and the players will meet with Scalise four or five times to propose candidates they would like to see considered, discuss people suggested by the athletic administration, and vet those who have applied for the position, Unger added. According to Harris, Scalise said that he hopes to commence interviews for the position in about a month. Harris also said that the most important quality he hopes to see in the new coach is an ability to relate to the players. “We want someone who we feel comfortable enough to talk to, that is more a friend than a coach,” Harris said. Point guard Drew A. Housman ’09 also suggested that on-court considerations will influence the players’ recommendations for the new coach. “The guys would like a more up-and-down offense to make it more exciting. We seemed to plod along on offense too much last year,” Housman said. Sullivan, who did not respond to requests for comment, informed his team on Sunday afternoon that he would not be returning. Sullivan came to campus Sunday and met with players in small groups to break the news and wish them luck for the future. Captain James A. Goffredo ’07 said that he and forward Brian P. Darcy ’07 had “built up a good relationship” with Sullivan. Because new coaches typically bring their own staff, Sullivan’s dismissal likely signals the departure of assistant coaches Bill Holden and Lamar Reddicks. Holden and Reddicks will be around for the remainder of the school year to assist with team workouts, Harris said. Sullivan will not have the opportunity to lead the Crimson in perhaps the most wide-open period of Ivy League basketball. Once-dominant Princeton finished last in the Ivy League for the first time in its history this season, and league champion Penn will be graduating its three top players. A new team, such as Cornell or Columbia, may be favored next season. Harvard could well be in contention for the crown next year and, with a core composed of sophomores Harris and Housman, could be a major challenger in two seasons. Scalise said in the meeting that one of his goals is for the team to win a championship before he departs as athletics director, Harris added. Sullivan’s players said they were sad to say goodbye to their coach, but they expressed optimism about a change in eadership. —Walter E. Howell and Ted Kirby contributed to the reporting of this story. —Staff writer Caleb W. Peiffer can be reached at cpeiffer@fas.harvard.edu.